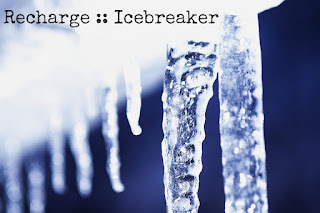 Recharge: Day Four - Hey, Hey, Hey - One Break, Coming Up! Hello and welcome to Day Four! Thanks for sticking with me this week. Today is going to be a little less intensive. We all need time to pause, think, read, and dream -- even at a writing retreat. While there won't be as many writing exercises, I'll give you some food for thought and an "assignment" that you can complete over time. Today is the last day of February. It's not a Leap Year, but I recently watched Leap Year, the movie with Amy Adams and Matthew Goode. In the movie, Declan asks Anna what she would grab if she had sixty seconds to escape a burning building. I'd like to know what book you would grab in your sixty seconds -- assuming your family, pets, and manuscripts are safe, of course. This is a tough question, I admit. Most of my books could easily be replaced. I considered my antique books, the books that are out of print, books signed by the authors. I own at least a dozen hardcover copies of GONE WITH THE WIND - many of them from the late 30s and early 40s (none from 1936, sadly, although I haven't given up hope that I'll find one for sale at a garage sale someday). I have books that belonged to my grandparents and my parents. 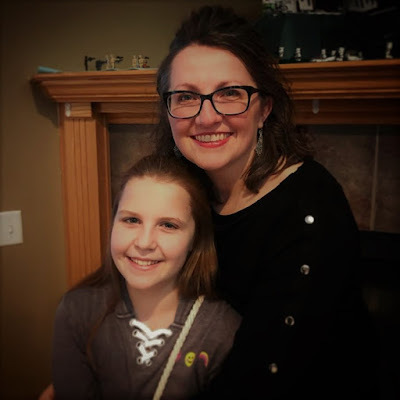 There are the literary journals that include a few of my short stories and that horrible independent study "publication" from high school (actually, that can burn). How to decide? 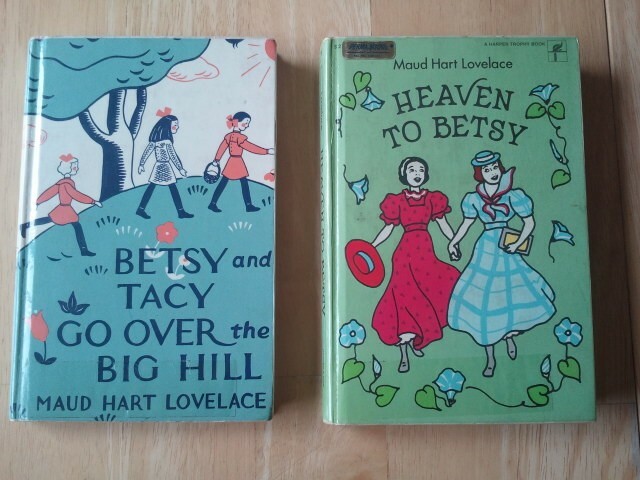 I would grab as many of my Betsy-Tacy books as I could carry. Those books were my first loves, the ones gave me the idea that I could grow up to be a writer. 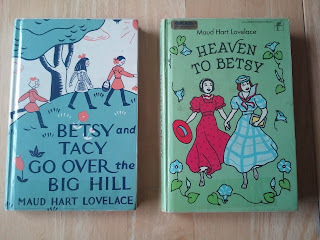 I've read them dozens of times over the years -- library discards from my childhood, used copies found at musty old bookstores, beautifully designed new editions. I would have to save them all. What do I mean by stretch? I mean moving outside the parameters of your usual routine as a writer. We get inspired, we write like mad, we read a lot, we blog, we tweet, we revise. we read some more. Since I typically write contemporary YA, I read a lot of contemporary YA. Every now and then, I shake things up a bit and read a dystopian or paranormal YA or an adult novel. Back in the old days (graduate school) when I was formally learning how to write, I read everything. I complained a lot about the poetry, but in hindsight, reading all that narrative non-fiction and poetry helped me write better fiction. Here's your assignment: Stretch. Go outside your usual reading routine. Haven't read the classics? Read THE GREAT GATSBY before you see the upcoming Baz Luhrman film. Read some poetry. Read a play (I recommend Our Town or anything by Arthur Miller). 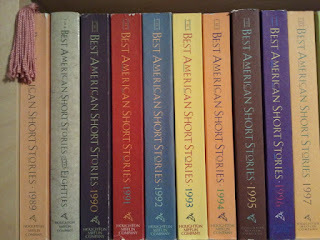 But mostly, I'd like to recommend that you read short stories. I learned how to write by reading short fiction. Writing short fiction is hard. 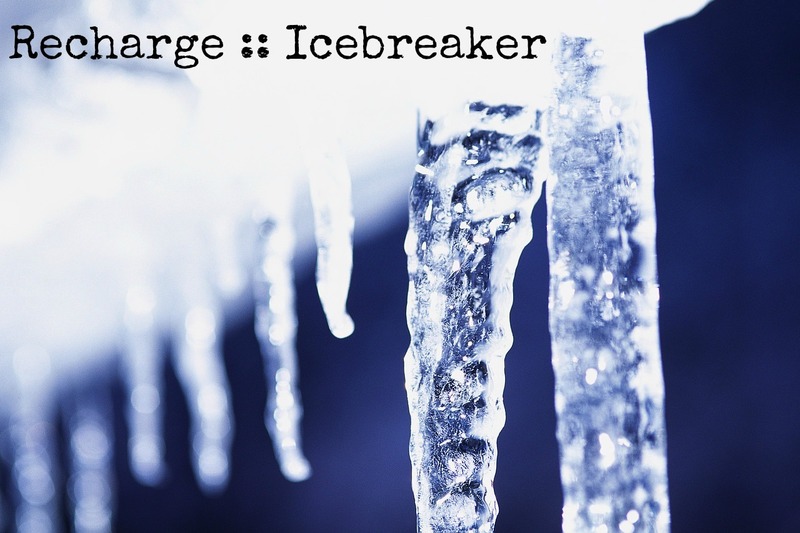 Not that word choice doesn't matter in a novel, but when you are dealing with the constraints of a short story, every single word counts. 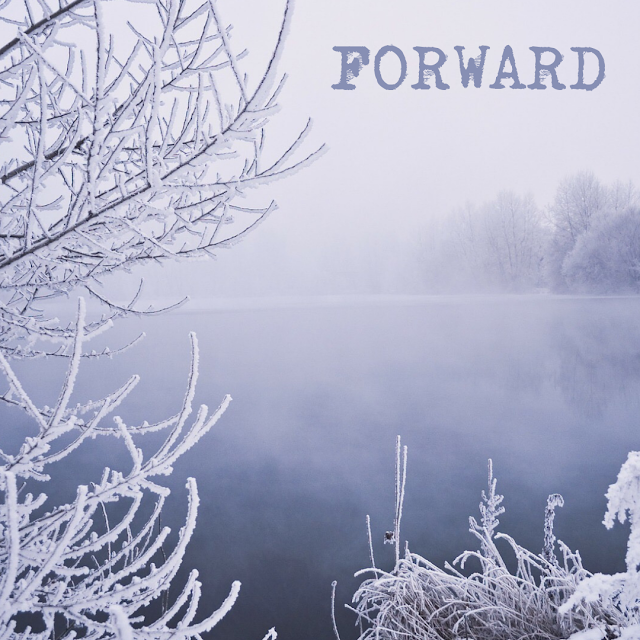 A short story does not require resolution at the end, but change must occur and the main character must transform in some way, just like in novel. You still need all the stuff you need for a novel, it's just, you know, compacted. It's like engraving the Lord's Prayer on a dime. 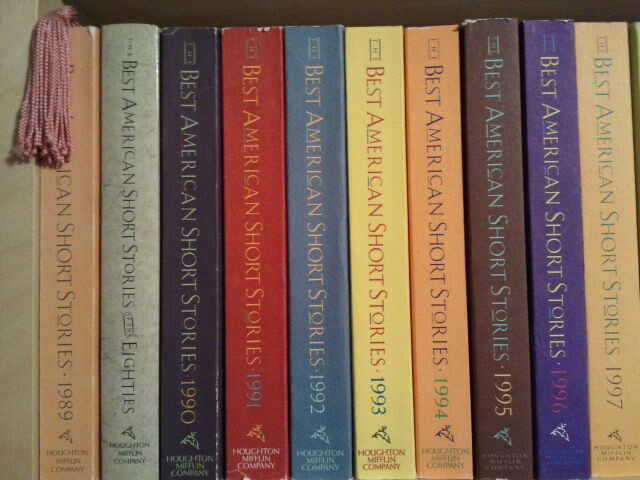 Since 1989, my parents have given me the BEST AMERICAN SHORT STORIES anthology for Christmas -- still, to this day. And even though my focus has been on young adult novels for the last few years, settling in to read one of these books is like settling into a comfortable old chair with worn upholstery. Like coming home. Read these, read literary journals, read the classics. You can't go wrong with a Norton Anthology. 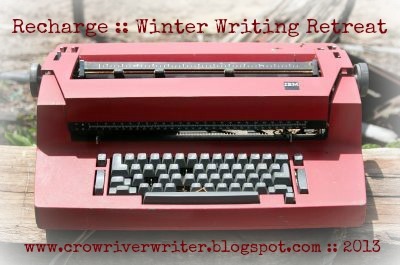 Read the short stories of Anton Chekhov, Ernest Hemingway, Flannery O'Connor, Raymond Carver. If you've never read Charlotte Perkins Gilman's "The Yellow Wallpaper," you must, today. James Baldwin, "Sonny's Blues." James Joyce, "The Dead." Kate Chopin, "The Story of an Hour." Tim O'Brien, "The Lives of the Dead." This is my challenge to you. Read something you wouldn't normally include on your TBR. See if an Annie Dillard essay inspires you, see if you're moved by the poetry of Li Young Lee. If you want to take it a step further, challenge yourself to write part of your WIP as a scene in a play, a poem, or a short story. Look at your manuscript from a different angle. Stretch. See where it takes you. Be sure to stop back tomorrow for a wrap-up and a giveaway! Great assignment - it's why I usually take books my dad hands me b/c they're titles I would have never picked up myself. Sometimes I'm really surprised by how much I love something I would never have thought to pick up! Grad school was good for that. I'd probably grab the sequel to The Passage, which I have on my night table. Hmm, as far as reading a genre I haven't really read much of, I'm about to start reading some classic sci-fis like Arthur Clarke's Childhood's End for a course I'm designing. What an awesome present to get from your parents each year!